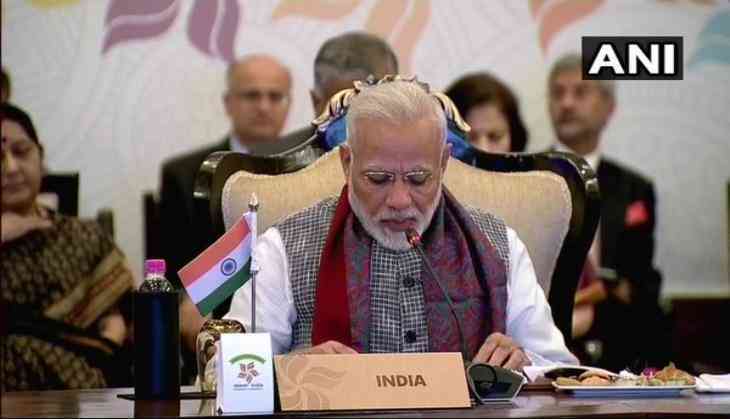 Prime Minister Narendra Modi underscored the ever-evolving ASEAN-India partnership on Thursday, terming the ASEAN-India Commemorative Summit as the "grand finale" of the joint year-long commemorative activities organised among the nations. "This summit is the grand finale of our joint year-long commemorative activities organized in India and the ASEAN countries which provides us with our valuable opportunity to review our journeys and chart our future path", Prime Minister Modi said in his address at the summit. Welcoming all the ASEAN nations at the summit, Prime Minister Modi further touched on the religious ties that bind all the nations, "Our shared voyage goes back thousands of years. The Ramayana, the ancient India epic continues to be a valuable shared legacy in ASEAN and Indian subcontinent. Buddhism also binds us closely. Islam in many parts of South East Asia has distinctive Indian connection going back several centuries". "We have made excellent progress in implementing the objective of ASEAN-India partnership for peace, progress and shared prosperity through a five-year plan of action", he added. Speaking on the diplomatic ties, the Prime Minister stressed that ASEAN is at the centre of India's Act East Policy, and added, "Since 1992 our partnership has evolved from sectoral dialogue to strategic partnership. Today we have third sectoral dialogue mechanism and seven ministry-level interaction in addition to annual summit meetings". Prime Minister Modi also expressed India's commitment to work with the ASEAN nations "to enhance collaboration in the maritime domain". The Prime Minister also pitched for strengthening economic ties among the ASEAN nations, "Our trade has grown 25 times in 25 years. Investments are robust and growing. We will further enhance trade ties and work towards greater interaction among our business communities". Is BJP denying Narmada water to Gujarat farmers to appease MP in run-up to the polls? READ NEXT >> Is BJP denying Narmada water to Gujarat farmers to appease MP in run-up to the polls?